LUNADA hosts our September literary ritual at the SF MOMA in the Koret Education Center, to kick-off Galeria de la Raza’s exhibit Remezcla Gráfica / Graphic Remix. Featured artists: Aleja Cobarrubiaz, L7, and a reading by the contributing poets from Josué Rojas broadsides project, ¡Gentromancer! 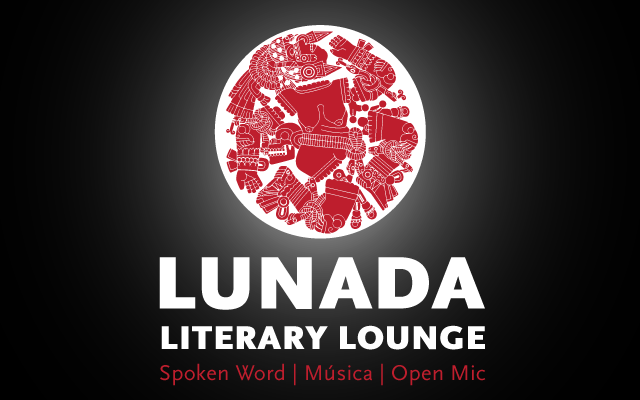 Lunada's featured line-up of stellar wordsmiths includes the debut of SF teen poet ALEJA COBARRUVIAZ, and South Bay poet and emcee L7 (L Siete), with a special collective reading by Paul Flores, Melissa Lozano, Nicole Henares, Vianney Casas, Stephanie Payes, Andrea Miller, Prishni Murillo, David Inocencio, Mary Mendoza, and Leticia Hernandez, sharing poems contributed to the ¡GENTROMANCER! project by artist JOSUÉ ROJAS. DOORS OPEN & OPEN MIC SIGN-UP AT 7:00pm: 10 slots on the list / 5 min. each, featuring first-timers, veteranos, poets, musicians, emcees, and storytellers in English, Spanish, Espanglish, and den sum, under the full moon. Aleja Cobarruviaz: Home grown in the Bayview of San Francisco, this queen in training finds solace in writing, rhyming, and producing. Her poems have been published in two anthologies with WritersCorps, and she performs at youth slams and poetry mics around the city. Aleja is a student at the Bay School of San Francisco, is a participant in the Artists as Activist Class, and is a co-founder and co-leader of the Hip Hop is Culture Club. Josué Rojas: is an SF based artist, muralist and educator. Visual concerns center around examining social-blindspots, employing the poetic, tragic and humorous. Rojas holds a BFA from the California College of Arts and Crafts, an MFA from Boston University, and is the recipient of the Albert S. and Esther B. Kahn Award. His work has been featured at Galeria de la Raza, SF City Hall, SOMARTS and IBA Boston. He is a lecturer at San Francisco State University at the College of Ethnic Studies. ¡GENTROMANCER! is a creative exploration of the city’s romance/affinity with gentrification through the personification of the phenomenon as an entity, utilizing images and poetry.